Garden decor can enhance the beauty of the plants in your garden. The accents you choose give your garden its style and identity. Garden decorations can be used to draw visitors to your garden, to call attention to specific aspects of the garden, or to liven up uninteresting areas. You can approach garden decorating the same way you would interior decorating. Start by identifying the mood or theme. Will it be formal or casual, traditional or unique? What is the predominating color scheme in the garden? The decorations you choose might be used to infuse your garden with a sense history, mystery, wildness, or whimsy. When choosing garden decorations, let your imagination be your guide. Typical garden decorations include urns, flags, gnomes, fountains, and even bird feeders. But you can decorate your garden with anything that strikes your fancy-an old bicycle, antique garden tools, a favorite rock, a hand-made mosaic, or even an outdoor fireplace. Let your garden reflect your personality. Most garden decorations are easily moved. So you can try them out in different sites before you find the perfect spot. You can rearrange your treasures as you acquire new ones. And you can display different decorations depending on the season. Garden decoration can be as simple as a well-placed pot. Depending on your garden, containers might be classic urns, rustic tubs, wicker baskets, or clean-lined modern pots. Maybe your garden calls for an eclectic mix of all sorts of styles. An attractive container garden depends not only on having the right pot, but also on choosing the right plants to put in it and the right spot to showcase it. Containers can be moved around depending on which area of the garden lacks interest at the moment. 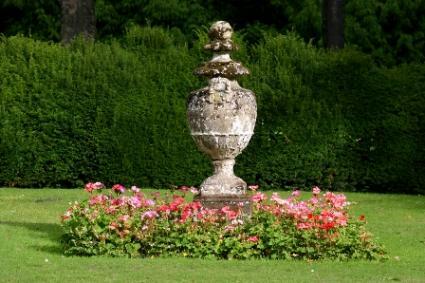 Strong garden accents such as statues, urns, and obelisks can be used to draw the eye along a path, visually lengthening the space. This is a valuable technique for making small gardens seem larger and for creating an interesting view where there's not one. The garden can be a great place to showcase meaningful works of art. Sculptures made of metal, wood, stone, and other natural materials look at home in the garden. Some people even transform trash or other found objects into interesting and folksy garden art. You can use garden decor to create garden rooms for outdoor gathering and relaxing. Create living walls with hedges, flower borders, or potted plants. The floor could be either a lawn or a patio made of brick or stone. If the area lacks shade or shelter, put up a gazebo or patio umbrellas. Furnish the space with comfortable seating and tables. Various types of furniture in wood, metal, wicker, and plastic are appropriate for outdoor decorating. Use wrought-iron lanterns or solar powered fixtures to provide light after the sun goes down. When it comes to decorating the garden, the possibilities are endless.